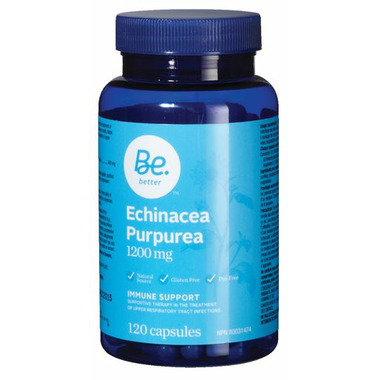 The Be Better Echinacea is a natural, gluten free, and dye free supportive therapy in the treatment of upper respiratory tract infections. Dosage: 1 capsule, 3 times daily, taken at the first sign of infection, or as recommended by a physician. Consult a physician for use beyond 8 weeks. Consult a physician if symptoms persist or worsen. Consult a physician prior to use if you are taking immunosuppressants, have an autoimmune disorder, or if you have a progressive systemic disease such as tuberculosis, collagenosis, multiple sclerosis, AIDS and/or HIV infection. Rare cases of severe allergic reactions have been known to occur; use caution if you are allergic to plants of the Daisy family.